Robert: I’ve been tying off some loose ends for an upcoming family trip to Europe. I’ve kind of backed myself into a corner in some instances, either by booking 2 award tickets and needing a couple more. Or deciding on a hotel with other members of our travel party then not seeing enough award availability for the rooms we need. On the earning front I’ve been working on a bunch of little deals here and there. But before I get into that I’m interested in hearing about your trip to Hawaii. How did it go, what did you learn, and perhaps most importantly…what did you eat? Sam: I’ve been following the booking of your Europe trip. I have to say your ability to hold partial reservations is inspiring. I couldn’t do it, even thought I know there’s almost always an eventual solution. As for Kauai, I ate everything in sight 🙂 I’m debating a full review of some of my favorite places on the island. We didn’t hit any of the better sit down restaurants on the island, which we did last time we went to Kauai. This time we went with local places. My favorite, Mark’s Place, and Konohiki Seafood are both close enough to LIH airport that they could be your first/last stop on the island. Mark’s place is Hawaiian plate lunches, musubi and a some seriously delicious baked goods. Konohiki has poke, garlic and ginger fried chicken and to go bento ready for the airplane ride home. Both of those spots have no indoor seating. Outside of that there were some local places we always like to hit, and a Pie shop in Kalaheo that I am seriously considering paying $100+ to have them ship me two pies. Grabbed a lot of to-go poke and tako and had lunches on the beach or in the car (we’ve all been there) picnic style. We also had a kitchen and a grill and did some cooking on days where it felt like a 40 minute drive wasn’t worth it. The carseat sits flush against the bottom and back of the stroller, and the sides of the carseat clear the stroller’s sides as well. The weight seems to be well centered over the middle of the stroller. I’m also working on a list of all the best beaches for babies/toddlers in Kauai. It is a unique island because there are many beaches that are nearly waveless. They are either protected by an offshore natural reef, or a break wall has been put up to create baby/toddler safe pools. What’s the latest on your Europe trip? Do you have a flight home yet Robert? Robert: Oh man, that food sounds terrific. After we got back from Hawaii we swore we’d eat an island-inspired diet for the rest of the summer. But it’s hard to find a lot of the ingredients locally, Ahi Tuna is expensive, and there aren’t many (any?) Hawaiian restaurants in the Boston area. Those beaches sound great too – looking forward to upcoming posts on that for sure. In case anyone missed it Tim Brooks did a great job on the Saverocity Observation Deck podcast with tips for travelling to and around Hawaii. If you’re more of a textual kind of person he’s writing a series of posts on the topic as well. On the European front, I got caught with some inconstencies in award space between what Avios.com showed and what United/Qantas showed. I transferred enough Citi ThankYou Points over for 4 of us in Business DUB-BOS, but as it turned out there was only space available for 2 in Business. I waited it out for a couple of months, but then even Economy award space vaporized on the flights we were committed to. The lesson I learned has been that Avios.com/British Airways over the phone has different award space than partners see. When I saw space for 2 in Economy I bought those so we’ll have 2 up front, 2 in the back. I’m seeing that as a trend for a number of family trips lately. We’ll alternate who gets to go up front vs in the back. I’m still not comfortable leaving our boys in back since they’re 13 and 11 now and technically problematic to book as unaccompanied minors (even if we’re on the same plane in a different class of service). Then, I booked 4 nights at the Conrad Dublin for 60,000 points per night. However, they don’t allow 4 people per room so I needed to gin up some more Hilton points and allow some free night certificates to become available. While that was going on, standard award space at the hotel vaporized and I think it even bumped up from 60,000/nt to 70,000/nt. It may be a good hotel (or not, who knows) but it’s becoming quite expensive with cash or points. I committed to this hotel with family we’re travelling with so it would be a bit of a production to switch at this point so it’s become a point of frustration. I entertained the thought of an AirBnB but decided against it. I found one AirBnB-type place that was actually bookable through the Chase Ultimate Rewards portal (here I go again with those Bank Points). But I tracked down some reviews of the place and people consistently were frustrated with the policy of needing to pick up the key 24 hours in advance. That’s a non-starter for our situation (and I would imagine others) so it kind of spooked me off that type of booking. Plus the family I’m travelling with is a party of 2 and had already secured the Conrad with points. Back to your Hawaii trip, you visited Kauai exclusively for this trip, right? Is that your “happy place” island at this point? Tell us more about your trip. Sam: We’ll have to do a pro/con post about AirBnB’s someday. I couldn’t have done those 9 nights in Kauai without an AirBnB. I packed 9 nights worth of stuff in my carry-on(backpack) because I had a washer in the unit. It also felt nice to be downstairs relaxing while my daughter was upstairs and my wife on the patio outside reading. Space is a luxury in the city I’m in so stretching out is always welcomed. Tim’s been tearing it up with Joe lately. I’m a fan of what they’ve been doing on Hawaii. He’s also been my go to for Hawaiian food advice for years now and has introduced me to many of the places I’ll be talking about, including some great baby friendly beaches. To answer your question: Kauai is the closest happy place I can get to in one flight, which puts it high in the running for my happy place at this point in my life. I’ve stayed on some extremely small islands in my past travels. Two of which had no cars at all. Both of those islands are on the other side of the world and are close to the mainland of their respective countries. Even though Kauai is a relatively large island it is the remote nature of Hawaii that I think I love. You’re almost smack dab in the middle of the Pacific ocean. When I look out I feel the weight of that distance, even if I’m still within the boundaries of the US. There really is something to being on the edge of the country (5 time zones from DC/NYC), and on the edge of the world at 160 degrees longitude. When a day ends on the Hawaiian islands you’re pretty nearly seeing the actual end of the day for the entire world. Which means you’re putting the world’s worries, fears and concerns to bed along with your own. That’s peaceful for me. I really love the public/private space in Hawaii and in Kauai especially. The idea that the best beaches in Kauai are untouched by development lets me look out at them and imagine that they haven’t changed much in the past 1,000 years. It is clear that tourism is a valuable part of the economy, but it feels like they’ve decided as an island that the public owns the best parts of the island and if anyone wants to buy/build/develop the rest they can, but only if they follow the rules. The island is small enough that you still see hand drawn signs touting “Fourth Saturday night market” as the sole publicity for an event that draws most of the locals. And when you arrive it is laid back, with live local musicians, home made food and not a worry in sight. I’m envious of kids who get to grow up there and feel so connected to the earth, but feel for the parents of those same kids who inevitably know they’ll have to leave the island for school and work and may never be able to return. I was happy to see how far Maui brewing has penetrated Kauai, it was plentiful almost everywhere and on tap at most places. I liked their beer when I was on Maui last year, and seeing it everywhere in Kauai made me think they’re going to be huge someday. The Maui Brewing IPA is delicious. If you can find the Mo’ Better Double IPA it is…well, Mo’better. Coffee in Hawaii is another area I love. It is just better there. Sure that could be the location vs. the beans. But I have to think it also somewhat reflects the great inputs that make a great cup of coffee on the output. 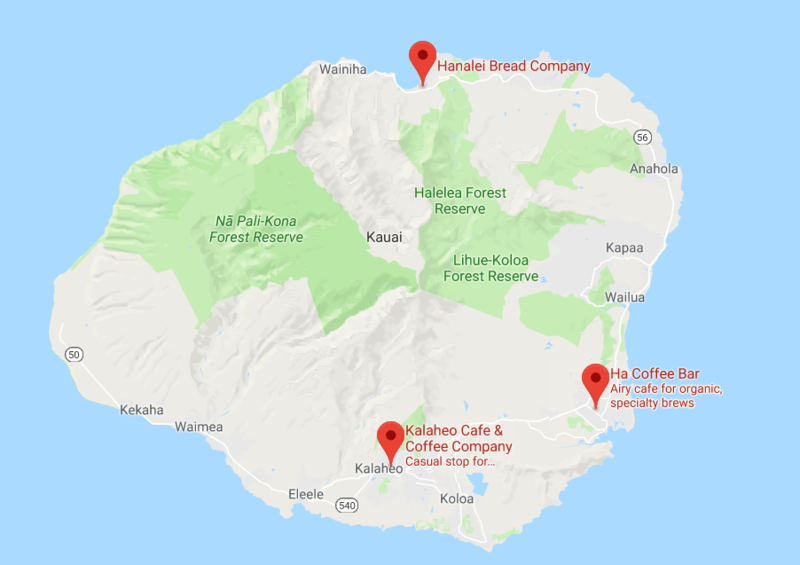 Three great coffee shops are Ha Coffee Bar, Kalaheo Coffee Co, and the Hanalei Bread Company. They’re all brewing some seriously good coffee with laid back interiors. Hanalei Bread Company is also steps from Hanalei Bay, which is probably the best beach currently open on the Island. Wherever you’re staying great coffee is close. Since Robert brought up Bank Points, and specifically how they fail: We booked 3 somewhat major tours and a minor tour. None of the major tours would have worked out with Chase UR points. Most were 20-30% higher than Viator or the tour operator directly. And the site www.hawaiidiscount.com ended up being 10-20% cheaper than even booking directly with the tour operators. I have no idea how they do it, but if you’re going to Hawaii check them out for your tours. Riding horseback across a 2500 acre ranch, with mountains and the ocean on either side of us. Zero car noise. Zero people. Just the sound of the wind in my ears. That’s a slice of heaven for me. I’ll see you [again] soon Kauai….but not soon enough. Robert: In the “no news is good news” department the Plastiq/Masterpass promo continues to roll along with a $250 per payment cap. Combined with the 3x/5x 35,000 point retention offer on the AT&T Access More card that’s going around this presents tremendous way to earn points while paying your mortgage and other bills fee-free with a Mastercard. They accept Mastercard Gift Cards (and even eMCGCs) so it can open up bonused spend opportunities and as a fee-free online liquidation source, albeit with a lot of clicking. I successfully paid my mortgage in > 10 $250 chunks and it posted to my lender as a payment without incident. At what point do we say “this is real and it looks like Plastiq is going to indeed run this promo thorugh September”? I ask because it’s borderline tempting to go out and take on a loan mostly for the purposes of it providing an avenue for repayment. Sam: I’m right there with you. At this point I think they’re going to stick with it. I’ve had some moderate luck with pushing payments to checking accounts, but I don’t know how much that will scale. My CU is offering me a PLOC, but if my other targets work out for me I won’t need it. We may also consider the number of American Express Cards you have opened and closed as well as other factors in making a decision on your welcome offer eligibility. They can of course determine whatever criteria they want for whether you can get signup bonuses, but what really irks me about this policy is the use of words like “may” and “other factors”. Banks, across the board, have done an awful job of pro-actively informing customers what the welcome offer is attached to a card when it arrives. You shared a tip I thought was helpful a while back, which was to secure message the bank when the card arrives to confirm the welcome offer terms “in writing”. That way you have a leg to stand on when it doesn’t post. This is more useful than screen shots taken while applying which, in my experience aren’t something banks are interested in accepting while reconciling a signup bonus dispute. If you at least have a welcome bonus confirmed in writing via secure message you’ll have a leg to stand on when it doesn’t post. And you can also avoid time wasted working towards the minimum spend requirement if the bonus is not attached. Then again, not all banks have chat/secure message available. And in some cases the first line reps aren’t adept at confirming a welcome bonus. What’s your take on this one? So while these nets feel like they’re tightening around all of us I think they’re really sharpening the spear that they are using to attack the worst of the worst. There’s a whole subset of heavy hitters who have [what seems like] no morality or sense of right/wrong. You’re seeing Amex craft strategies the same way an HR department has to craft strategies. These CC issuers are trying to manage people’s actions in roughly the same way. Robert: Frequent Miler made the case that it’s high time to get the Chase Ritz-Carlton card because the Tier 1-4 free night certificates the card comes with will [probably?] be converted to Marriott points, the card is not subject to 5/24, and there are some status angles to be played. 120,000 Marriott points sound nice, and the $450 annual fee can be significantly reduced with the $300 air travel credit with a little work. I have the card already but I don’t think I’ll be going for it for my wife. The status isn’t worth much to me, the free-night to point conversation “opportunity” is a bit uncertain, and at the end of the day I’m not as excited about Marriott/SPG points as other currencies. Semi-related we had some back and forth with Greg and Nick over at Frequent Miler discussing their 1st Year Estimate approach to valuing a signup bonus. I really like the approach conceptually. But it gets complicated quickly, and this one is a good example of why it gets complicated. Not only do you have to contend with valuing esoteric benefits like status, but you’ve got the uncertainty of the value of these free night certificates and whether they’ll actually be converted to Marriott points. Then what’s the derivative value of those points? At any rate, if this is such a great deal why is the 1st Year Estimate “only” $304? Seems like there are a lot of intagibles with this one that aren’t making it into the value calculation. What do you think? Deal or not a deal? And what do you think of their 1st Year Estimate approach to valuing signup bonuses? Sam: I’m in a bit of a unique spot with Chase right now, so I’m not considering the Ritz-Carlton card at all. As for the estimated value: I think it is a good idea to do some basic math for people–but I don’t know where that number comes from. Even if you assume the nights are only worth $300 each, that’s around $650 or so for those two nights and the 10k points. Subtract $450 but add the $300 airline credit. I’ve got a minimum $500 first year value here. Then there’s all the assorted smaller benefits which make the $304 seem even more off. Kudos to Greg/Nick for the quick replies and fixing the issue on this one card. These tweets illustrate why it is almost impossible to create an ‘estimated value’ that works for everyone. Should the opportunity cost of a 2% or 3% card be used? What is the actual value for these Ritz-Carlton nights? If you hold the card for 2 years and never use them your first year value is certainly negative. I’m certain there are people getting much more than these estimated values, just like there are people getting less. Robert: Speaking of Ritz-Carlton it’s nice to see Chasing the Points back in action with a heads up that Ritz-Carlton’s Yacht Collection site has been updated with some itineraries and pricing. The obvious play here is using Marriott points but I doubt that’ll be a good redemption if/when it becomes an option. But the pricing is surprisingly, not insane? Maybe I’m just de-sensitized to outlandish cruise prices after dealing with Disney Cruise Line over the years, but with 7-night cruises starting as low as $4,600 per person on what I’d expect to be a very premium boutique ship going to some seriously interesting smaller ports, that’s cheaper than a lot of AMA Waterways river cruises and not necessarily out of line with Disney Concierge pricing. Might be a nice couples escape starting in 2020. Sam: I’m glad you brought up Chasing the Points. I noticed his posts this past week as well. I too hope even if he posts infrequently this means he’s back writing. I probably should have put this in the above Hawaii talk, but I heard a great This American Life episode on the Hawiian Island of Niihau, very interesting to listen to both sides of the arguments for/against the lifestyle and island’s rules. That’s a wrap for this week. Ping us on Twitter @Milenomics and @RobertDwyer or leave a comment – we’d love to hear from you. I vaguely recall what this might be about, but, in my old age, I’m not sure. Any link to more info? Blue: Pretty sure you’ll get to the explanation a little later in the post. Basically the last time I spoke to Robert he had no return flight for half of his family for a Europe trip that is approaching soon. Ha! Okay, just finished the post. For some reason, my mind was thinking that “eventual solution” was more “hackerish”…like cancelling a partial trip because of a schedule change or something. Blue: Ah that stinks, but a good DP to share. I’m seriously considering a large 6 figure Chase UR dump at 1CPP and just call it a day. Deep down I know right after I do that I’ll find a sweet price mistake only on the UR portal. AsideL it does not have to be a US carrier — the charge has to be in USD. Speaking from personal experience here with Aeromexico and SAS.